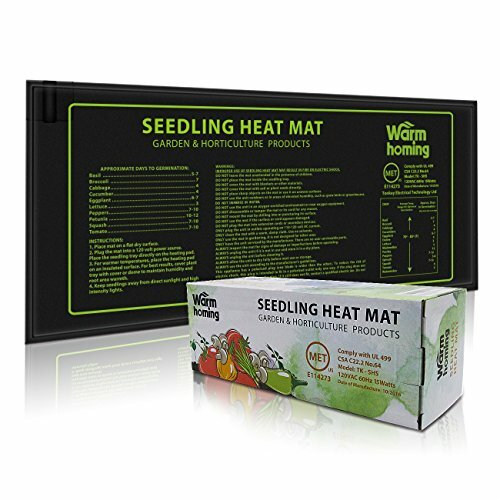 The Warmhoming Seedling Heat Mat increases growing success by warming plant roots and maintaining a controlled temperature all season long. With the ability to warm 10-20°F over ambient temperature, this heat mat will work even in drafty places. 1. Locate a flat, dry surface of the appropriate size for your heat mat. 2. Avoid cold surfaces, and they will counteract the heating ability of the heat mat. 3. Plug the heat mat's electrical cord into a standard 110-volt outlet. 4. Place a propagation tray or other plant container on the heat mat. For best results, cover seedlings/cuttings with a humidity dome. Failure to observe the following safety guidelines may result in fire, electrical shock and/or damage to the heat mat. ✓ Seedling heat mat for better veggie, herb, and flower seed germination. We have MET LISTED in US, comply with UL 499. UL-Listed Waterproof Construction Safely Retains Moisture. ✓ Improved Design & Efficacy. Seedling heat mat is the new, stronger heating wire and thicker multi-layer construction. ✓ Warms root area to 10 to 20°F above room temperature to Improve root growth. Increases the success of seedlings and cuttings, durable construction, waterproof and easy cleaning. ✓ Dimensions: 18.5"x 8.5"; Watt: 15W; SJTW Power Cord's Length: 5.7ft. Can be placed in many different sizes of seedling bowl. ✓ Perfect for All Your Plant Types. Applied bottom heat is a real boon to virtually any planting in your home garden. Whether you're growing veggies, herbs, or flowers, our advanced heat mat increases the success rate of seedlings and cuttings by a remarkable measure.